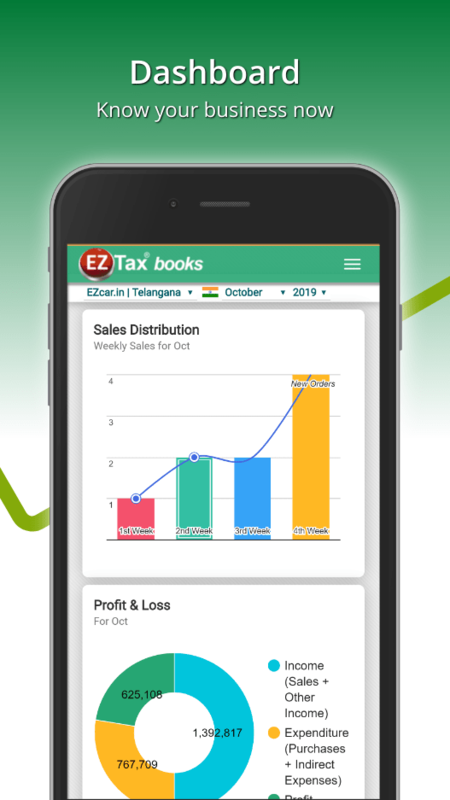 GST Online Accounting Software Mobile App for Small Business from EZTax.in is a complete, Comprehensive Goods and Service Tax ready Accounting Mobile App (Application) to help you prepare GST Compliant Billing, Maintaining Books, preparing GST Returns, manage your expenses, Profit and Loss, Balance Sheet, Analytics that let you know how well your business is doing real-time, online, all on Mobile while you are on the Road. Multiple users to login and work under single licensing, Sales Analytics, Customized Views for Regular, Composition, Month Close Process, Multi-Channel GST returns, Multi-Country, Multi-Currency for Export Invoicing, Purchase Orders (PO), Conversion of Purchase Orders into a Purchase Entry, Excellent User Experience, Easy to understand language, Artificial Intelligence, above all, Count on our Outstanding Client Service. Possibly why SiliconIndia Magazine identified EZTax.in GST Accounting Software as the best among Online Accounting Software. If you already registered Online at https://eztax.in/gst, just DOWNLOAD and start using the app on Android smart phones today. It’s FREE and takes few secs as the app is just 1.3MB, which is the smallest possible app size.